I think we’re all used to having a budget for every project, but in a tough economy, many of us are operating on shoestring budgets—budgets that feel confining, and can stifle creativity. And even with really tight budgets, it is generally expected that the end product will still be of the highest quality and creatively presented—so how can you break out of the box without breaking the bank? The following is a list of tricks that will help your folded project look good on the cheap. I love the trifold—it’s the worker-bee of the industry, but if you want to get some attention, there are a handful of other folding styles that are considered “production” folds that are easy to set up on the folding machine and fast-running. Double parallel folds, roll folds, accordions, and even gate folds can be affordable if your printer has a gate fold attachment. Do a little research before settling for the everyday trifold. 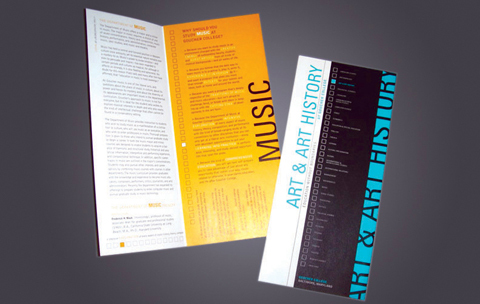 As a habit, you may be making all of your brochures to the same folded size. Try something different! Before choosing a new format, be sure you understand the end application of your piece – does it have to fit into an envelope, a display, a pocket folder? Is it a direct mail piece? All of these questions will determine the right sizes and formats, but if you have some flexibility, stop working on autopilot. Ask your printer for guidance regarding what sizes and formats will print efficiently. You can also change direction and create a piece that is horizontal in format for a fun twist. A switch from vertical to horizontal format can totally change the look and feel of a folded piece. If you’re really sold on a trifold, add some pizzazz by trimming the cover short. The slim vertical strip of area that will be revealed by the short trim can have bright colour, or large vertical text, or a peek of imagery—and it’s just a simple trim. Cheap! How about an angled trim on a corner? That’s just a guillotine trim, not a die, so again, not much cost to you, but eye-catching and different. A simple short trim on a cover can turn a standard tri-fold in to something special. Heavy ink coverage, done well, looks luxurious. It also potentially gives you the opportunity to downgrade the paper a bit and save some money. If you’re covering the entire brochure with ink, you don’t need a premium sheet with the highest brightness. You may be able to use your printer’s house sheet or other economical choice for a nice savings. One caveat—don’t get too aggressive—downgrade too much and your heavy ink coverage may not look so good on your cheap sheet. Heavy ink coverage almost always requires scoring, as well. Ask your printer for guidance. OK, this tip is not for everyone, but if you want to avoid costly hand work or machine time in the bindery, and you have a small print quantity and a score so you can see where the folds fall, then you might be able to coax a few friends (or interns) to join you for a folding party. Other possible cost-saving hand tasks include assembling and inserting into envelopes, and wafer sealing. Maybe you can splurge on a die and have the sheets delivered flat for hand-folding. Make sure you have a lot of friends or employees to help. If you really want to save, plan ahead. Figure out what you need to produce within a certain time period and gang it together in one press run. 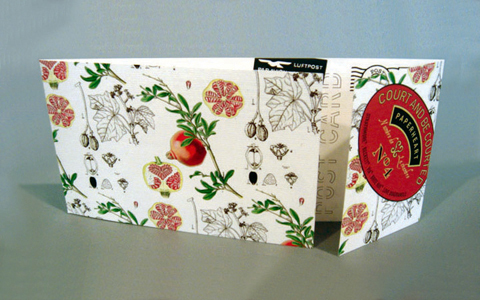 Design your holiday card now so that it’s ready at a moment’s notice to jump on a press sheet with another project. Do the same for your postcards, sell sheets, and other collateral and tell your printer you’re looking for opportunities to gang projects together. A lot of printers are investing in in-line finishing equipment, which is making a lot of processes that traditionally have been performed off line, a part of one continuous process. You may be avoiding scoring, perforating, cutting, and gluing because you think it’s unaffordable, when it may actually be within your budget if performed in-line. Ask your printers if they’ve adopted any in-line processes. This tip is the most important of all. Establish a nice working relationship with your print vendors and let them know that you are looking for ways to cut cost while upholding quality. Your printer is a great partner and resource—get them involved and ask them for advice, rather than making assumptions and cutting your options short without knowing for sure what is within reach. Trish Witkowski is Chief Folding Fanatic at www.foldfactory.com. Visit foldfactory for folding ideas, videos, resources, software tools and more. Join the community and start receiving the “60-Second Super-cool FOLD of the WEEK” e-video. You can contact Trish at trish@foldfactory.com.